In the midst of California's worst drought on record, which has reduced crucial waterways to a fraction of their usual levels, wildlife officials have decided to help give millions of baby fish a fin up --by offering them a free ride on their journey out to sea. Normally, chinook salmon born at the Coleman National Fish Hatchery have to swim themselves 200 miles down the Sacramento River to reach the open waters of San Francisco Bay, but this year they'll be taking the freeway. Due to a lack of rainfall, the Fish and Wildlife Service fears that releasing the 12 million newly-hatched fish into the low and slow running river would be a death sentence, so they plan to drive them there by truck starting next week. "It could literally be lethal to all the fish released, and none of them would make it out to the ocean," says Bob Clarke, fisheries program supervisor for the USFWS. "That would do nobody any good to release fish at Coleman and have them all perish." But transporting the fish by truck as opposed to making them find their own way is certainly not ideal, says Clarke. That first critical journey downstream is important to imprinting process which drives the salmon to return to the same spawning grounds to reproduce. 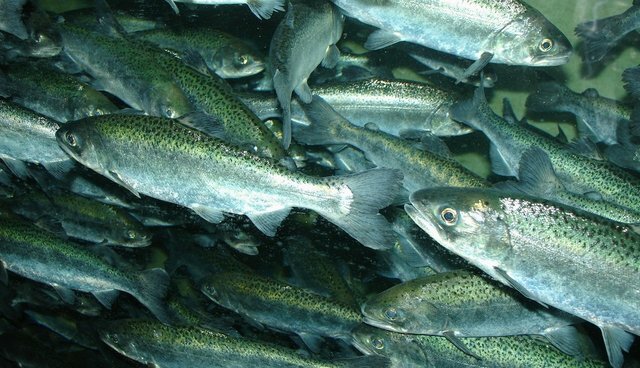 As a result some fish will likely lose their way, potentially crowding out rivers where wild born chinook salmon come to spawn. "All of a sudden, it looks a little brighter because the federal government moving these fish in a truck means survival numbers will go way up and we'll see more fish in the ocean two years from now."